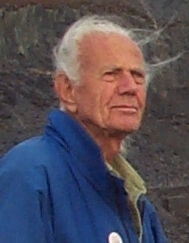 John Lowry Dobson (born September 14, 1915) is a popularizer of amateur astronomy. He is most notable for being the promoter of a design for a large, portable, low-cost Newtonian reflector telescope that bears his name, the Dobsonian telescope. The design is considered revolutionary since it allowed amateur astronomers to build fairly large telescopes. He is less known for his efforts to promote awareness of astronomy (and his unorthodox views of cosmology) through public lectures including his performances of "sidewalk astronomy." John Dobson is also the co-founder of the amateur astronomical group, the San Francisco Sidewalk Astronomers.